When you need a surface that is taken from a raw slab, custom fabrication is how you can get that material to form a beautiful final product. Whether you own a business, or just a homeowner looking for the best surface possible, custom fabrication is a fantastic way to create the best image possible. What is custom fabrication? When you need a surface that is taken from a raw slab, custom fabrication is how you can get that material to form a beautiful final product. Through the latest technology, custom fabrication can provide you with a surface that matches your exact personal image. Before you start this process, you might want to learn more about what custom fabrication can do for you. In order to do that, read on, and let Rock Tops Fabrication introduce you to the world of custom fabrication! No surface is exactly the same. Raw slabs of granite, marble, or any other material are riddled with variation. It makes it much easier to achieve the most original, custom look–but it also comes with some fabrication, first. Custom fabrication is the act of perfecting these surfaces into something gorgeous that will compliment any space. Rock Tops Fabrication has expanded to include every option you could ever wish for. After you select your materials, Rock Tops Fabrication uses the latest CNC technology in order to cut the raw material exactly to your specifications. You’ll be able to see design, color specifications and size before the material is cut, and then you’ll be given that exact result. It’s simple, really; digital technology allows for the most accurate, most well-crafted materials yet. These slabs are then cut with a water-cooled diamond bit saw. This allows for the most accurate cut, which matches your digital template exactly. After polishing, a final inspection takes place. Of course, inspections are done throughout the entire process; however, this final inspection of the material allows for those small imperfections to be fixed. While you may have a material in mind, do you have an edge pictured? That’s right; there are many different types of surface edges that you can work with. Depending on whether or not you have a contemporary or classic style, these edges can match perfectly with whatever image you have in mind. We offer an eased edge, a bullnose, a bevel, an ogee, a cove dupont, and a triple pencil edge. While each of these edges will offer something different, and while they can be mixed and matched with any style or material, it’s important to remember that you can always call us with questions you may have. There are truly no limits to the design of your surface. Where is Custom Fabrication Useful? The art of custom fabrication is far-reaching. 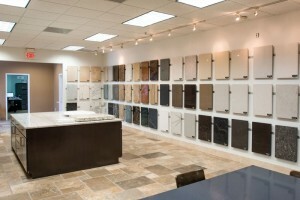 While it can cover the surfaces of countertops and so forth, custom fabrication can be used for a variety of purposes. For example, you could use your custom stone formations to surround your fireplace to achieve any look or style. Using natural stone around your fireplace could provoke a rustic, natural feel–or, perhaps, a marble surface could help to make the space feel more ornate. Regardless, you have plenty of options. You could also consider other projects, such as a granite counter for your outdoor kitchen. Granite is tough and wears well, so it’s a perfect solution. On top of all of this, though, are countertops. In the kitchen, the variety of countertop materials and designs allows for an incredible level of customization. Your style is yours to choose! Custom fabrication can also be used in bathrooms, where countertops can make a huge difference within a smaller space. Make a lasting impression with the right style, and the right material that’s best for you. There are a variety of materials you can use for your surfaces, which each come with advantages and disadvantages. Let’s go over a few of them so you have the whole story. Marble: What a timeless choice! Marble is a beautiful, elegant surface that comes in a variety of colors and styles. While it needs to be sealed frequently to protect it from damage, it also provides a beautiful finish, that provokes beauty year after year. Granite: There’s a reason granite is so popular. It’s durable, and surprisingly so. With so many colors and combinations, granite boasts quite the impressive lineup. It does need to be sealed occasionally, but cleaning is a breeze and requires nothing special. Quartzite: This is a naturally occurring stone that is incredibly hard and long-lasting. Quartzite is crystalline and beautiful, durable stone that will be elegant, yet modern, in every situation. Quartz: Do you love the look of natural stone, but you aren’t sure if you want to make the maintenance commitment? Quartz may be the perfect choice! It’s mechanically manufactured, so it possesses all the hardness and quality of natural stone while still being pain-free to take care of. IceStone: Frequently mistaken for granite, IceStone is a brand that is manufactured in the United States. It’s made of glass and concrete, and comes in many colors that are sure to fit whatever aesthetic you’re going for. Vetrazzo: Durability, beauty and signature style; Vetrazzo has it all. Made entirely of recycled glass, Vetrazzo is a virtually maintenance-free surface that can transform any area into a work of art. Neolith and Dekton: Both of these are compact surfaces that are great options if you’re looking to avoid damage and wear. They’re frequently being referred to as some of the most durable materials on the market. Invest for your areas that receive a lot of harsh attention! Polished: With a polished finish, you’re looking at a surface which will be spectacularly shiny and smooth. Sealing your natural stone with this finish is going to make the stone appear darker. Honed: A honed finish is a bit more matte, and gives very little reflection. There are no imperfections in the surfaces of honed finishes, but it’s not quite as smooth as a polished surface. Other: There are plenty of other finishes, like antique or leather finishes, that you can learn more about if you contact us! Customization is easy when you work with Rock Tops Fabrication. This entry was posted on Monday, January 9th, 2017 at 3:34 pm. Both comments and pings are currently closed.